The Tarot is a deck of cards that originated over 500 years ago in northern Italy. Although the Tarot was first used in a game called Triumphs, it was quickly adopted as a tool for divination, and made popular by occult societies such as the Hermetic Order of the Golden Dawn. The early Tarot symbolism was deeply rooted in Medieval and Renaissance Europe, but over the centuries it has grown to incorporate everything from Astrology and Kabbalah to runes (which predate the Tarot by 1000 years) and the I Ching (which predates the Tarot by 2500 years). 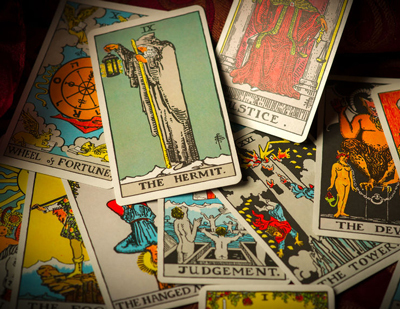 Today, Tarot Cards are the most popular tool for spiritual introspection in the West. A Tarot Card Reading tells you about love and relationships, career, health, and wealth. It will give you information about your past, present, and future. A Tarot Card Reading can be a useful way to reflect on your past and take a fresh look at your current situation. The cards present a potential future which you can choose to pursue by staying on your current path or change by making significant changes in your life. It’s a great way to see your life in a new way and decide if you like where it’s heading. Don’t delay, call now to find out what’s in your cards!